Reflectorless scanning helps archeologists explore and document endangered Native American art in Arkansas. Arkansas’ archeological heritage includes one of the most remarkable concentrations of American Indian rock art in eastern North America. These art sites are priceless treasures. Etched, painted, and crafted in antiquity, they stand as reminders of a culture and a people who existed centuries before. Ironically, their protection and preservation require technologies that encompass the antithesis of their inherent character. Precise, fast, and mobile measurement was needed to capture and accurately record their intimate detail and prevent the forces of erosion, natural elements, and potential vandalism from eradicating them. This sounds easy enough, but manpower and expertise—along with required measurement and data-collection equipment—are not without limits. Also, site access can range from moderately challenging to darned near impossible. 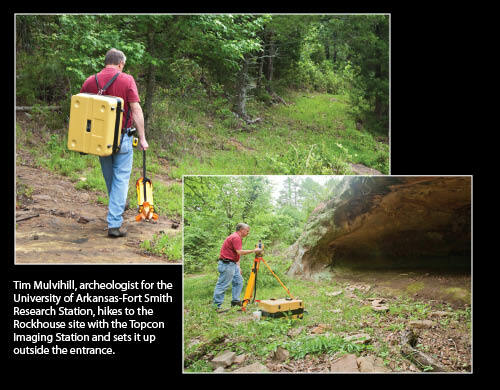 Given these challenges, the team of Dr. George Sabo III (professor of archeology at the University of Arkansas), Tim Mulvihill (research station archeologist for the University of Arkansas-Fort Smith Research Station), and Evans determined their need for long-range scanning and imaging robotic total station capabilities. The first people arrived here about 12,500 years ago at the end of the last Ice Age. Their descendants, who made the rock art we can still observe today, may have been the ancestors of the historic Caddo, Osage, Quapaw, Tunica, and Wichita tribes who were here when the first Europeans arrived. Archeologists believe that most Arkansas rock art was produced during the Mississippian era (A.D. 900-1541). 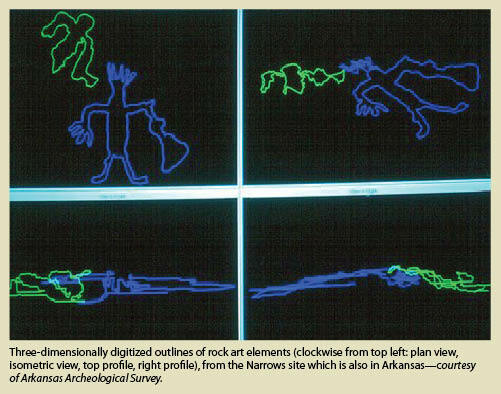 Anthropologists and archeologists define rock art as images carved, drawn, or painted onto immovable rock surfaces. Images that are carved or engraved into rock are petroglyphs. Images made with paint or other pigment are pictographs. 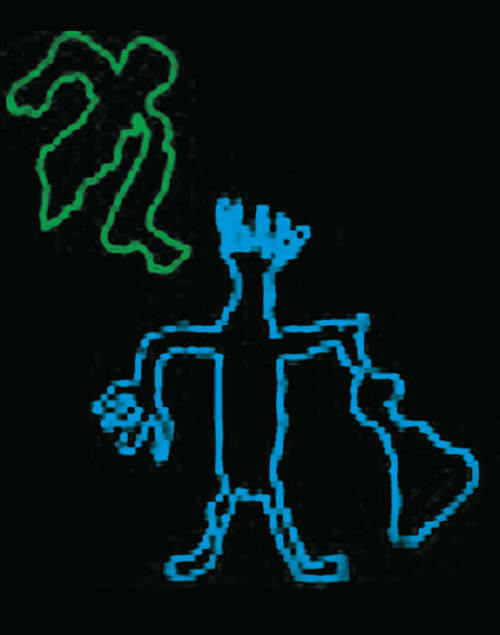 Some rock art images, such as painted petroglyphs, were created using a combination of techniques. Archeologists recognize that different rituals took place in different locations. Rock art at secluded, hard-to-reach sites is thought to have been made during individual rites performed in solitude (for example, vision quests or puberty rites). Images at larger, more accessible sites are thought to be the result of shaman practices performed for the benefit of the wider community. Their system had to be capable of producing photography with dimensions to properly capture and record the fragile, complex sites; it had to be portable, and it had to be efficient. Working with Hayes Instrument Company of Shelbyville, Tennessee, they selected the Topcon IS total station for the job. “Doing field scans on secluded sites was a nightmare,” Evans said. “We needed accuracy and ruggedness. When you can set up and gather data quickly and efficiently, you can do more extensive work at the site. “Bluff shelters are difficult to get around in. The reflectorless scanning solves a lot of that, allowing you to get back into smaller spaces. We’ve been using total stations for years and generating maps … but those older versions don’t really do bluff shelters justice. Our new system provides much more accurate depictions of what’s going on at the site.” Accessing some sites hewn into cliffs is easier because this system can reach up to 2,000 meters and can be quickly and easily reconnected if contact is lost. The art (and its history) has been a fascinating subject for scanning. “The ‘wow’ moment for me,” Evans said, “has been the realization that each of these sites was a small piece of a bigger picture, and that it was important that we gather each piece thoroughly and consistently so that they could be used in understanding the larger cultural context someday. Mulvihill said he has developed a much deeper appreciation for the Native American Indian culture through the work. “You could tell it was a special place to the people who created the images. Evans explained that scanning offers huge benefits for the rock art exploration and documentation efforts—generating high-quality scans “that blew us away and that can be used immediately in our research.” Also, educators and their students benefit from the ability to access and view 3D models of the rock art sites. Three-dimensional models give viewers a more accurate, detailed snapshot of how the sites were arranged, actually allowing the viewer to experience a virtual walkabout around the site. Conventional photography—even with panoramic views—cannot convey that same experience. “You can take that 3D model and embed it in a larger digital model that can be thought of as a sphere or globe. That allows you to take the viewer even deeper inside,” Sabo said. Augment that with digital photographs, and the viewer can be transported inside the shelter looking out—a virtual recreation of the visual experience Native American Indians had centuries ago when they created and used these sites for vision quests and other rituals. If you would like to view this article in Romanian, please view the link below. John Wallace is president of Wallace Communications, providing strategic communications counsel and media support to technology-oriented companies.